There are several types of electrotherapy treatments including ultrasound, interferential, laser and shortwave diathermy. There has been a move away from some of these techniques following further research, not because they do not work in their way, but because we have found other methods more effective. You may still have some form of electrotherapy as part of your treatment session utilising those that have proven benefits at certain points of the healing process. We use Shockwave extensively and have a specific page about this here. Neuromuscular electrical stimulation (NMES) can be a beneficial supplement to traditional forms of therapy in the patient who finds a muscle function is reduced either by inhibition [post injury] or even the period post-surgery [e.g Knee]. This inhibition may demonstrate itself as either weakness, with or without loss of bulk [atrophy], or even the lack of ability to “switch” the muscle on, despite the patients best efforts! 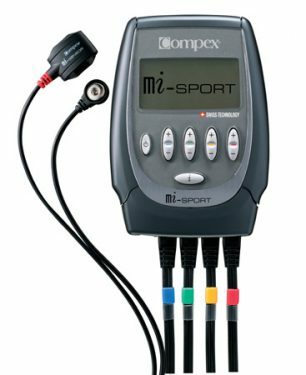 We can use a simple non-invasive, no painful, neuromuscular stimulator such as “Compex” or Neuro Trac [Neurotec] devices to override the patient’s inhibitions and produce a muscle contraction. The patient can “passively” let the muscle contract through the stimulus or later on in the rehab process can actively join in with the contraction. A great example is the rehabilitation of most knee conditions where one of the quadriceps muscles, the Vastu Medialis, can atrophy very quickly indeed. You will recognise this muscle as the “teardrop” shaped muscle on the inside of the knee. By stimulating this muscle very soon post injury or postoperatively you can not only keep the muscle firing but can maintain some of its bulk. Later in the rehab you can perform simple exercises such as step ups or squats along with the muscle stimulation to make quicker and better gains in muscle strength and function. It has been reported that after knee joint replacement, a patient group who engaged in highly intensive activation of the quadriceps muscle using electrical stimulation produced better results for strength and muscle activation compared with a control group. The primary objectives of rehabilitation after ACL reconstruction are to reduce inflammation, regain neuromuscular strength and functional performance, recover normal range of motion, and reintegrate the patient to everyday activities. Studies have shown that the activation pattern of the quadriceps and hamstring muscles, as well as restoration of proprioception, play an important role in rehabilitation after ACL surgery. A recent review concluded that rehabilitation training with NMES superimposed on voluntary contraction was better than either NMES or voluntary contraction practised separately.